Yesterday Jen met a dog named Justice. 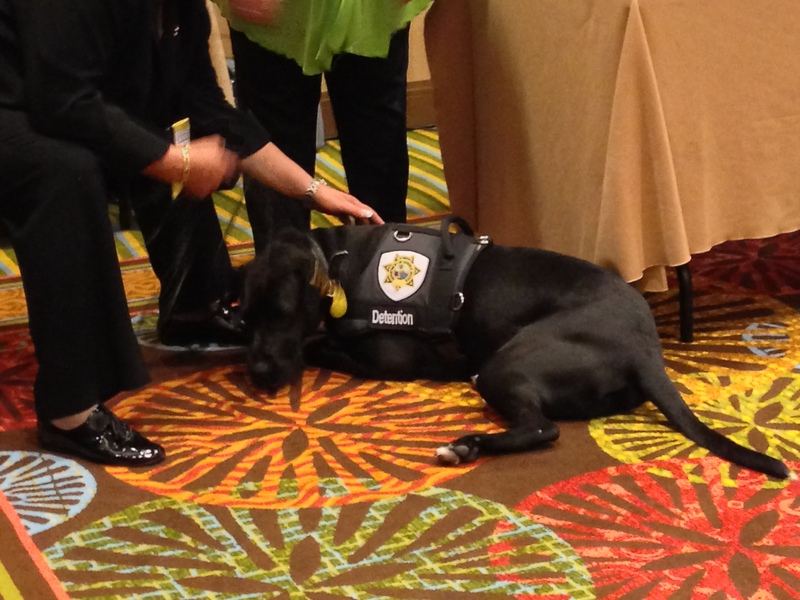 Justice is a therapy dog that works at the Miami-Dade Regional Juvenile Detention Center. 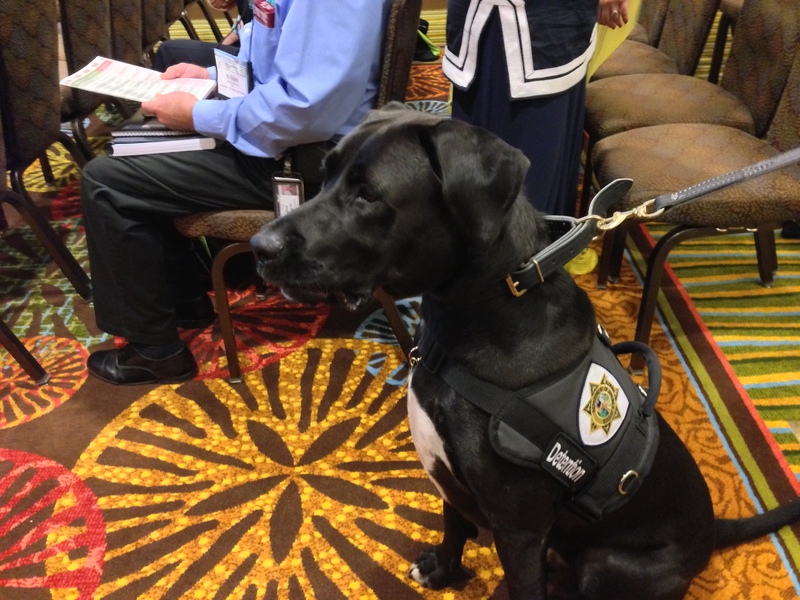 He is a Lab/Great Dane mix that was rescued from Big Dog Ranch Rescue in Wellington, Florida, trained by Miami Dog Whisperer Richard Heinz, and certified as a Pet Therapy Dog and Canine Good Citizen. 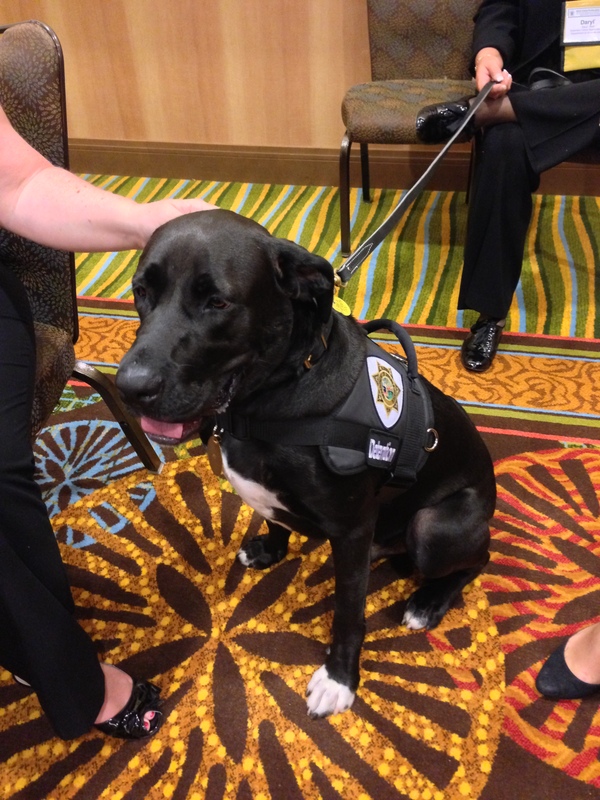 Maybe you’re asking why there’s a therapy dog at a detention center. After all, these kids are criminals! Truth is that most of these children have experienced a great deal of trauma in their short lives, and Justice is exactly what they need. petting a dog is great therapy! Justice is good at his job, too. In that room filled with professionals, I don’t think one missed getting licks by Justice. Yes, he licks! I know many therapy dogs are trained not to do that, but Justice is encouraged to give kisses. Center Superintendent Daryl Wolf said that in the six months since Justice has been on the job, incidents have decreased by over half. When a child becomes agitated, staff ask the child if he or she would like time with Justice. The detention center is aware that not everyone likes dogs. During intake they let children and their families know a therapy dog is used. Children are screened for allergies. No child is forced to interact with Justice, and he is never brought on the scene if there’s a situation requiring intervention. Everybody loved meeting Justice, and Justice loved meeting everybody! Justice has been so good at his job, FL Dept of Juvenile Justice is planning to eventually have a dog at each of its detention centers. Justice there to provide therapy much like the dogs that go into hospitals! The kids are, however, learning how to care for a dog through exposure to Justice. Brilliant boy …we have similar programs here and they really have a great beneficial effect ..mainly on adult offenders here..but they learn to love and to be less selfish,they finally have something that loves them without any prejudice and gives them a sense of belonging..he is beautiful and what a great post! There are programs where where incarcerated individuals train dogs, but therapy dogs used inside is not common here…. yet. Same here training dogs and I am sure therapy dogs will take off where you are…the benefits are great. When you think that most offenders have not had animal companionship and have lost the ability to care,to have them learn from the dogs and then become more caring is a win win in every way! The superintendent said for some of her residents, their only interactions with dogs has been negative so they learn about the love dogs give too. That’s right and I makes for life long perceptions of dogs! Justice does an amazing and essential work. Bravo ! I think I should be a therapy dog too! woo woo woo! It is good to hear of an institution so enlightened as to employ Justice. All the more so, in Florida. The state is not exactly exemplary in its treatment of inmates – even juvenile ones. I’m sure this story brings a tear of joy to the eyes of the former White House Boys. Props to Justice for being so good at what he does, props to Florida for her brush with compassion and props to you, Rumpy, for bringing us this great bit of news. Yes. Dozier still stands in Marianna and it gives Jen the creeps when she drives by. Look for a ping-back to this post, later on today. Dogs like to work and they usually do a good job at what they do! Justice is a very cool woofie! Thanks for sharing. Great story. It is amazing how beneficial animals are to humans. If only humans would reciprocate. I love this. I want to get my dog into training to be a therapy dog. How wonderful this Justice Dog is!!! One of the best things that dogs can is to heal things that humans can’t! That’s so true about trauma. We pooches help so many people don’t we? And, hey, Justice is a big version of me! A white chest and a white foot! Sweet. THAT is just AMAZING and WONDERFUL….. good fur JUSTICE!!! What a great story! Dogs almost always have a calming effect on people. Yay for Justice! When I work at the VA, I’m pretty sure I am not as well behaved as Justice. He is doing very good work. Dogs just put people in a calmer frame of mind. They exude love and acceptance and these juveniles are given something they may never have had before. Hooray indeed! I so enjoy reading these kinds of stories. Dogs give give give so much of themselves, and it’s lovely to read that Justice’s love and warmth are being shared with these love-deprived adolescents. What a wonderful story. We need more Justices. That’s fantastic! Justice does wonderful and amazing work! Justice is a wonderful example of how humans and animals can interact in a positive way – and the meeting could change that human’s life for the better. Inmates have also been used to train dogs. It is an excellent way to reach someone and to have them feel that they have made a valuable contribution in life. I’ve heard of inmates training dogs, but not every inmate gets a chance to train a dog. In this detention facility, every child who wants can have time with Justice. He was a way cool dog! Jen worked in a juvenile correctional facility for 4 years. She’s also worked in adult prisons. The juveniles were some of the meanest kids you’d ever want to meet, and they were also suffering from deep hurts. Can’t be a coincidence, can it? BTW, in the 4 years she worked there, she was injured only once, and even then it wasn’t serious. What a wonderful story! I sure hope that the juvenile justice system here in California follows in Florida’s footsteps ASAP!! I hope that all juvenile facilities do! Great job Justice!! Your Big Dog Ranch Rescue family is so proud of you!!!! Wo0F! I hear you are also assisting with finding the other dogs! Yay! Four paws up here! Dogs and cats can be great helping to rehabilitate and we are not discriminatory either! Animals can bring big changes into peoples lives. The same way animal lovers like myself ask for a second chance for animals, the same should be given to humans. We tend to choose to see only one side of the coin, judging the situation. The fact is criminals have sad, traumatized lives, many with no opportunities in life. With all that leading them into a hate trip. So, to help them through love which is all a dog can be, is the best chance you can give them to change. Like the dogs in prison, a wonderful project not only saving dogs lives, but too the prisoners themselves. I know that this does not mean they will change but, it is a chance given to them or an experience that could prove to change their lives down the line, you never know. Awesome Justice!!!! What a lovely dog! I hope this means the focus for young offenders is shifting to help and rehabilitation.